The real battle for resources on 21st-century Earth will be about food and water, and Ireland has an opportunity to become a Silicon Valley for agritech innovation, writes John Kennedy. If you scratch beneath the surface, the majority of Irish people, even the most ardent city dwellers and urbanites, have a close connection to or are just a generation removed from the soil. As most farmers will tell you, however, the agricultural sector and rural way of life are under threat and it is hard to make a living off the land in the way that sustained previous generations. Many farmers hold down extra jobs and the most innovative of farm owners are diversifying, creating new artisan food products and in some cases converting disused farm buildings into visitor centres and even gyms. The key to the future of agriculture lies in innovation and entrepreneurship, and many start-ups and new research ventures in agricultural technology (agritech) are beginning to thrive thanks to calculated policy. In some ways, we are already on our way to becoming the Silicon Valley of food. Ireland already produces a significant portion of the world’s infant formula and, according to Bord Bia, 20pc of China’s needs for infant formula. Danone has two baby food plants, one in Wexford and one in Cork. Abbott Nutrition produces infant formula in its Cavan plant and Nestlé has a plant in Limerick. Kerry Group is also working with some of China’s biggest baby food businesses to jointly produce infant formula. Our beef production is a global export industry renowned for its high quality and, despite the uncertainty posed by Brexit, the wheels of commerce will still need to roll. And the world will need to eat. At an environmental conference I attended a few years ago, it became a talking point that the biggest security crisis facing 21st-century Earth won’t be political, but about protecting food and clean water supply routes. As the world hurtles towards 8bn people and the gap between rich and poor continues to expand, the strategic points will be overland routes between Pakistan and China, for example. Because of pollution, generations-old traditions of Somalian fishing have been destroyed and some fishermen have turned their attentions to a bigger catch: piracy. Global warming will wreak havoc on once-fertile lands. Where once there were forests, there are deserts; where once there were fields, there will be sea. The role of Ireland in this troubling future could be pivotal. This morning (4 February) we reported how Meath start-up Hexaflyraised €1.1m in funding after building a solid export business that uses insect farming to create a more sustainable protein to defend global food supply for generations to come. You could say that the father of entrepreneurship in the food and agritech industry was the late Dr Pearse Lyons, the entrepreneur and founder of Alltech who sadly passed away last year. Louth-born Lyons built a global business empire that employs more than 5,000 people across 100 manufacturing sites. Lyons began his career at Harp Lager while studying at University College Dublin and, after graduating with a master’s in brewing science, he landed his “dream job” at Irish Distillers. His work led him to Kentucky and, with just $10,000, he established Alltech in 1976. He used his own garage as a site, working on the principle that yeasts and enzymes could be used in animal feed. Alltech became the fastest-growing company in the global animal health industry through innovative technology, creative marketing and strong branding. The example and traditions set by Lyons continue to be embraced by new generations of Irish entrepreneurs. Last August we reported how Devenish Nutrition, the Belfast-based agritech player, secured €118m in funding, including €40m in investment from the European Investment Bank (EIB). At the time it was reported that the investment would pave the way for 100 new jobs and a new R&D operation to enable Devenish to develop what it calls its ‘One Health, From Soil to Society’ programme in Dowth, Co Meath. This also fits neatly with an initiative driven by Meath Enterprise, which, with support from Meath County Council and several stakeholders, is hoping the Boyne Valley Food Innovation District will accelerate food innovation and research, and turn Meath into the Silicon Valley of food. Recently funded to the tune of €1.5m through the Regional Enterprise Development Fund, the Boyne Valley Food Innovation District will focus on the development of food-grade production facilities and an innovation-rich enterprise support ecosystem to escalate the growth of food and drink entrepreneurs. Hundreds of research and technology jobs stand to be created. The tapestry of agritech innovation continues to expand. It was announced last year that Waterford was to be one of nine regional clusters across the EU to act as centres of agritech innovation as part of a €20m project called SmartAgriHubs. A €2m partnership in early 2018 between dairy manufacturer Dairymaster, IT Tralee and Lero set out with the aim to bring new IoT and AI technologies to agriculture. Irish agritech start-ups are also achieving global success. Two years ago we reported how Institute of Carlow spin-out MicroGen Biotechwon the Thrive Sustainability award at the Forbes AgTech Summit in California. Thrive is an agritech venture and innovation platform founded by Irishman John Hartnett’s SVG Partners in 2014. Headed by Xuemei Germaine, MicroGen Biotech applies constructed, functional, microbiome technology to increase crop yield and health, while protecting food safety by remediating pollutants and improving soil fertility. You can’t talk about the future of food without also noting the achievements of Dr Nora Khaldi, whose company Nuritas last year raised €30m in funding from the EIB. The Dublin-based start-up is also backed by U2’s Bono and The Edge as well as Salesforce’s Marc Benioff, and is working with food and pharma giants such as Nestlé and BASF. Nuritas combines IT and life sciences expertise to mine DNA and protein data from plant materials in the hope of discovering new food components to help prevent, manage and possibly even cure disease. Other agritech start-ups to watch include MagGrow, which has developed a breakthrough device that reduces unwanted and potentially dangerous drift from crop spraying, and which raised €3m last November to fund its development and global roll-out. Another start-up worth noting is Moocall, which is taking an IoT approach to cow fertility. It has developed a sensor that tells farmers when a cow is ready to calve. 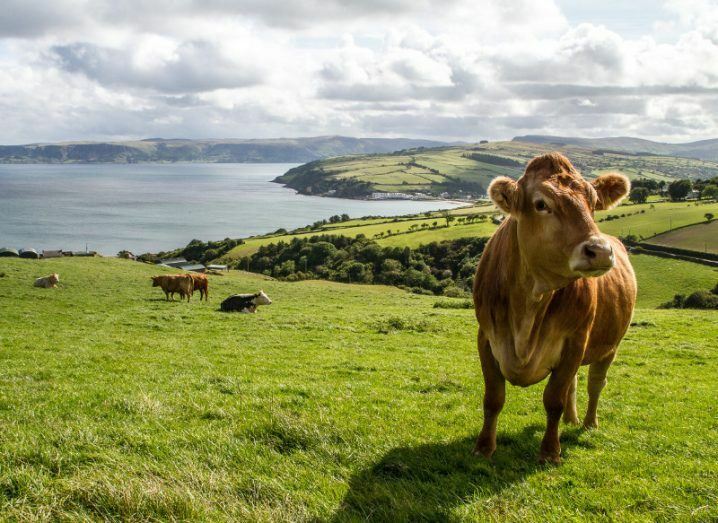 Simply put, Ireland’s traditions in agriculture and its location as a source of safe, high-quality products, from baby food to beef, will put it centre stage in a world where safe food supply will be key. This is an opportunity we must nourish in order for entrepreneurs and innovators to flourish. And save the world in the meantime.